Cross stitch finishing service. | Cross Stitching Heaven. Why am I providing a cross stitch finishing service? Hi and welcome to cross stitching heaven the complete cross stitch finishing service for you. Having done many cross stitch projects over the years, given to me by family and friends I now have a house full of wonderful pieces of art. Many friends have asked me why I decided to provide this service and the answer to that was simple. I love cross stitching and I wanted to be able to continue my love of cross stitch. It’s a win, win situation, I’m turning my hobby into a business while providing a cross-stitch completion, service to others. Which is why I started Cross stitching heaven, a cross stitch finishing service set up in the hope that I can inspire others to enjoy their own finished cross stitch kits again. Unfortunately, as with all hobbies or obsessions, I no longer have room for any more cross stitch projects. So I’m offering my services to others who may not have the time or the patience to complete their own works of art. 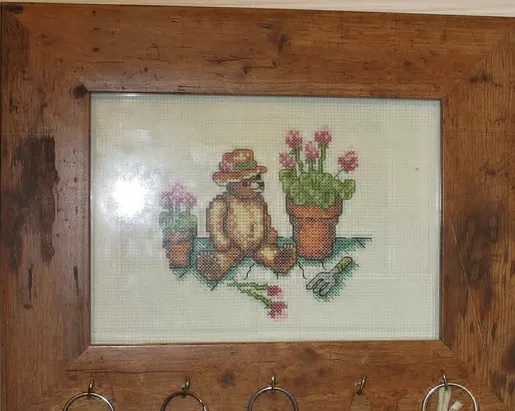 The cross stitch project of the Gardening Teddy featured on this page was given to me as a Birthday gift. As I had nowhere for my keys to hang I completed the cross stitch pattern, framed it, added small hooks. It now hangs as a finished piece in my hallway – that precious place where all good keys come to rest at the end of the day!